Roasted Sweet Potato Butternut Pumpkin Soup. Autumn is upon us as the beautifully colored leaves on the trees are now at their peak in my area of Virginia. We have had a lot of rain and some cooler temperatures which finally ignited the color change. The grocery stores, coffee houses, and bakeries are featuring popular seasonal pumpkin-flavored items. Since Halloween has passed, we’re looking forward to pumpkin flavors at Thanksgiving, too. My Roasted Sweet Potato Butternut Pumpkin Soup fits right into my repertoire of delicious Autumn flavors and can even star on your Thanksgiving menu. 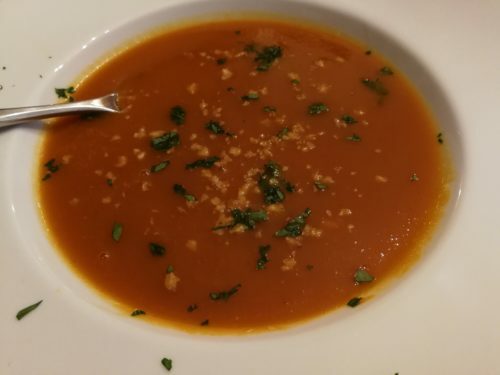 Last Winter, I created my Roasted Sweet Potato Butternut Pumpkin Soup recipe. I froze two large containers of it for future meals. 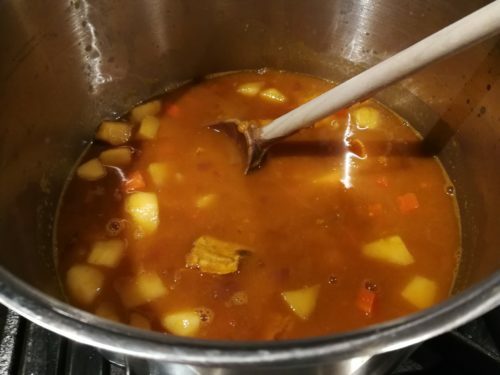 My husband loves this soup and he’s not a sweet potato fan at all. Each time we enjoyed this soup, he asked me to make more. And since the soup was a hit, I’m posting the recipe this time. It’s been tested several times and I think I’m done with my tweaks. My Roasted Sweet Potato Butternut Pumpkin Soup is plant-based with no added oils and meets whole food plant based diet and vegan diet requirements as well. Roasted sweet potatoes are the stars of this soup. 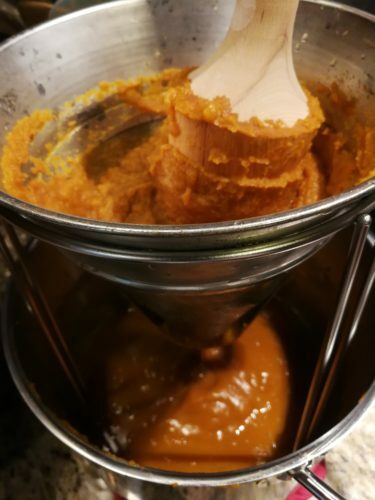 Butternut squash and pumpkin purees add depth. 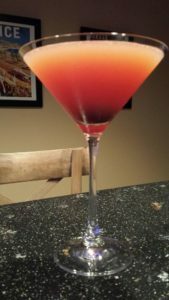 Gala apples add some sweetness. And cinnamon, nutmeg, and maple syrup add some spice. For this recipe, I used Pacific vegetable broth and Trader Joe’s canned pumpkin and butternut squash purees. Start out by roasting some sweet potatoes. You can roast them whole or cut them into pieces. I like to leave the skins on until roasting is done and then remove the skins when the potatoes have cooled. Dice some onion and carrot. Heat some vegetable broth in a soup or stock pot. Caramelize the onion and carrot in some vegetable broth. You might need to add a splash more broth if it evaporates before the veggies are slightly browned. 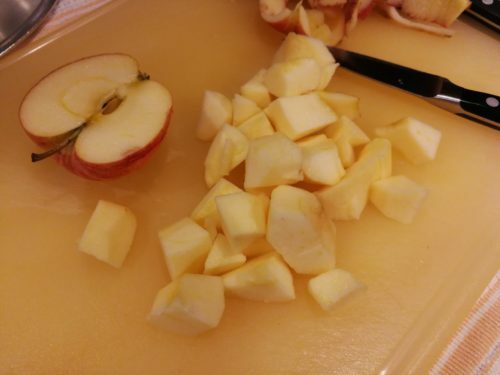 Peel and dice some Gala apple. 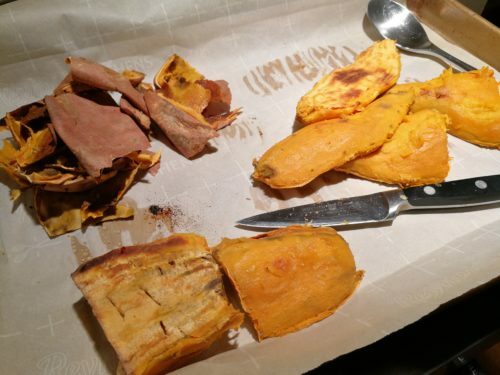 Remove the skins from the roasted sweet potato pieces. 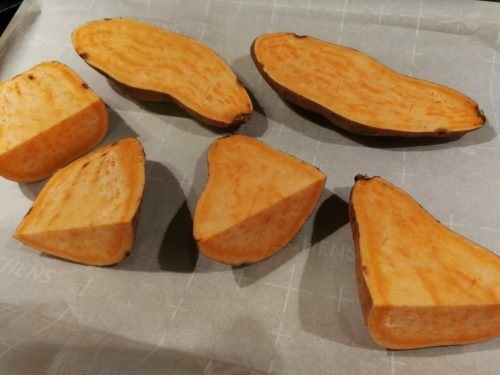 Cut the sweet potato into smaller pieces. 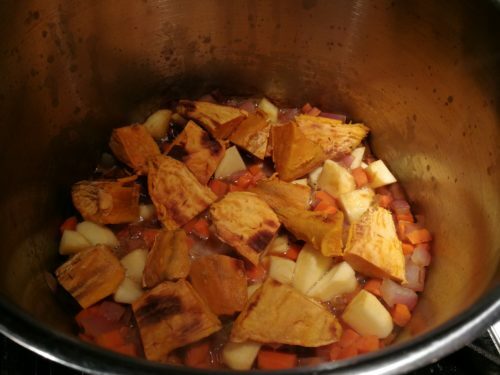 Add the sweet potato pieces to the soup along with the diced apple. Cook for a few minutes, stirring once or twice. Add the pumpkin and butternut squash purees along with the rest of the vegetable broth. Simmer the soup for about 20 minutes until it thickens slightly. Remove the pot from the stove. 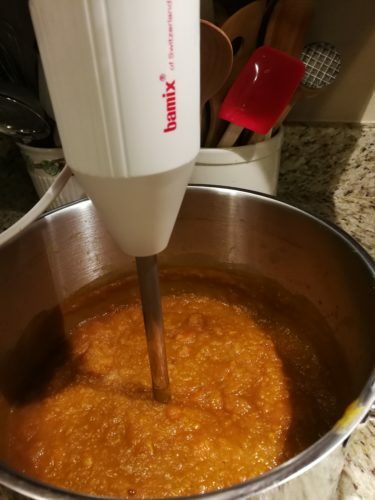 Puree the soup with a hand blender or you can puree in batches using a regular blender such as a Vitamix. 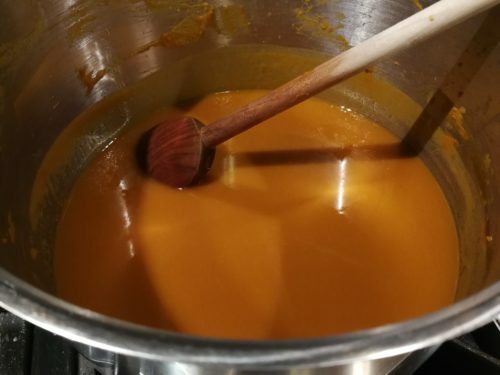 You may prefer a smoother or a chunkier soup so puree until you get a consistency that you like. 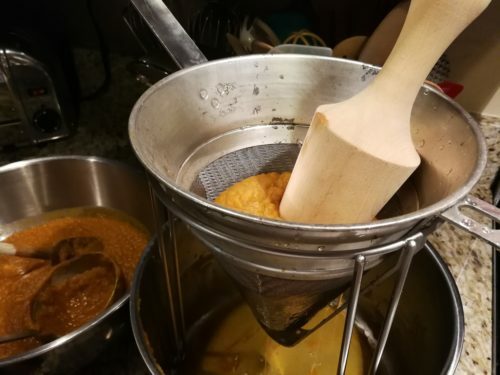 If you would like a velvety smooth soup and don’t have a Vitamix blender, you can force the pureed soup through a china hat with a wooden pestle. Use the leftover solids as a side dish for another meal or as an addition to homemade vegetable stock. Return the soup to the pot if you have used a regular blender or china hat. At this point, you can freeze the soup and add the spices later. If you want to serve the soup right away, warm it and add some salt, powdered cinnamon, and freshly grated nutmeg. Sweeten the soup with some maple syrup. If you want a thinner consistency, add some additional water or vegetable broth, warm through, and you are ready to serve. 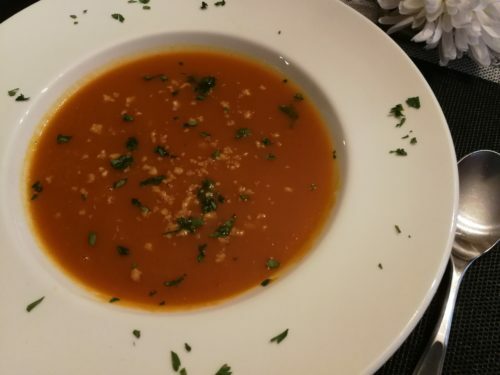 Ladle the soup into bowls and garnish with chopped walnuts and finely chopped parsley. 3. Leaving the skin on, halve the sweet potatoes lengthwise and you can also cut them into large chunks for more even roasting if the potatoes are large. 4. Roast the sweet potatoes skin-side-up for 30 minutes or until they are soft when pricked with a fork. Turn them over halfway through roasting. 5. 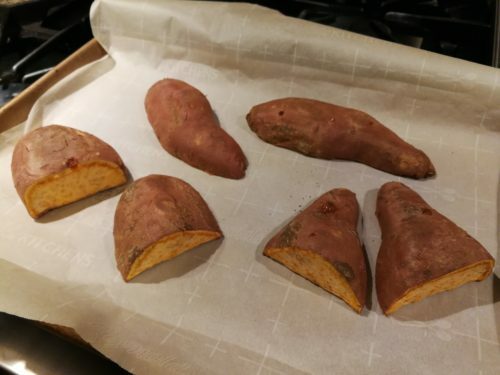 When the sweet potatoes are done, remove them from the oven and let cool. 6. Heat 1/2 cup vegetable broth in a stockpot. 7. Over medium low heat, saute the onions and carrots in the broth until slightly caramelized. 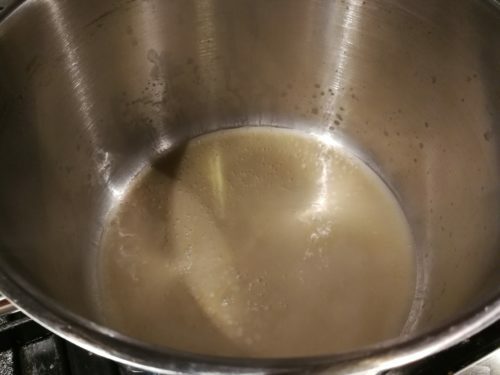 You may need to add more broth or some water if the liquid evaporates. 8. 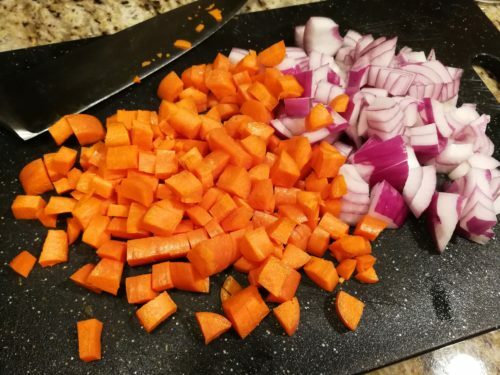 While the carrots and onions are cooking, peel the roasted sweet potatoes, discarding the peels, and cut the sweet potatoes into smaller chunks. 9. 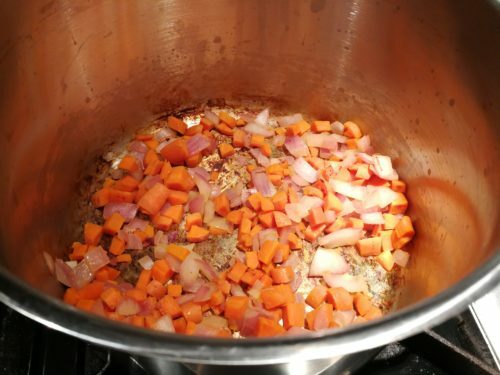 When the onions and carrots are soft and have caramelized, add the sweet potato pieces, the chopped apple and half of the rest of the broth. Let cook a few minutes, stirring once or twice. 10. Add the canned butternut squash and pumpkin purees and the rest of the vegetable broth. 11. Using one of the empty puree cans, add two cans of water to the soup. 12. 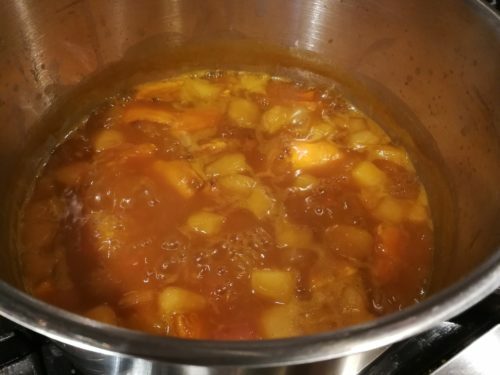 Simmer the soup over medium low heat until the vegetables and apples are soft and the soup has thickened slightly. 13. Puree the soup with a hand blender or a regular blender. Puree to your desired consistency. 14. For a velvet-like soup consistency, strain the soup through a china hat into another pan. Reserve the solids for homemade vegetable stock or another recipe. 15. 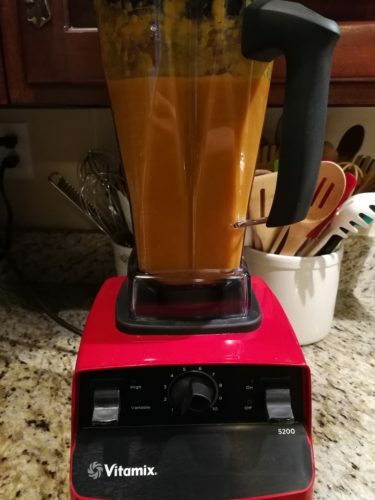 Return the pureed soup to the original pot if using a blender. At this point you can freeze part of the soup for future meals. 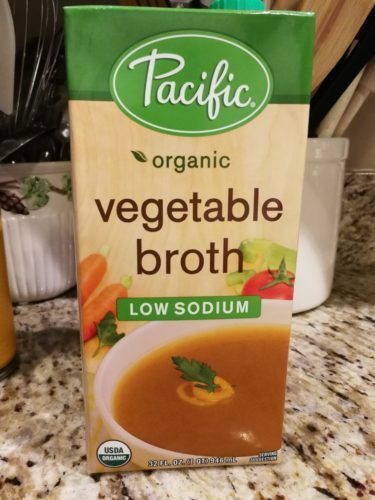 You’ll need to add additional vegetable broth later. 16. 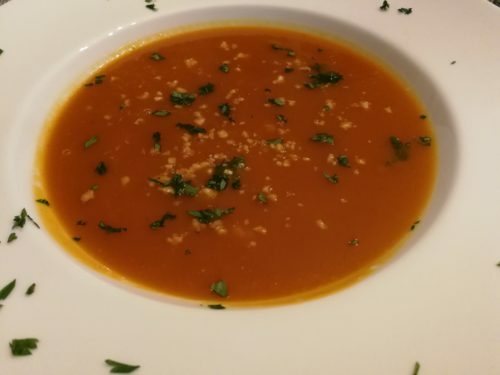 If you are serving the soup right away, you may wish to add more vegetable broth or water for a thinner soup. 17. 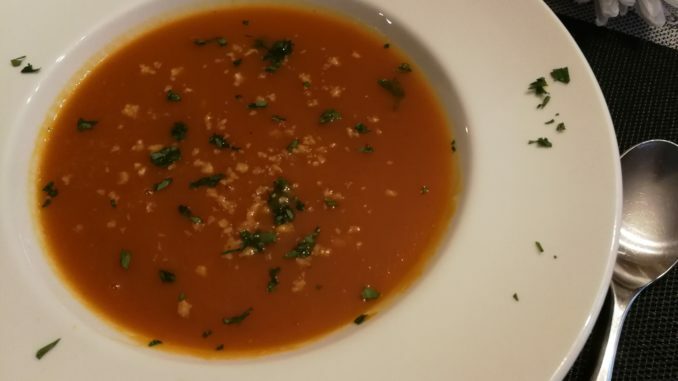 Season the soup with the nutmeg, cinnamon, maple syrup and optional salt. 18. Reheat the soup on low heat (do not boil) and ladle into soup bowls. 19. Garnish the soup with chopped walnuts and finely chopped parsley and serve. Makes 6 – 8 cups of soup. 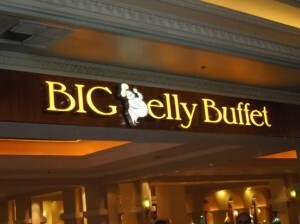 Offer with a side salad such as my Chopped Salad and some crusty bread. 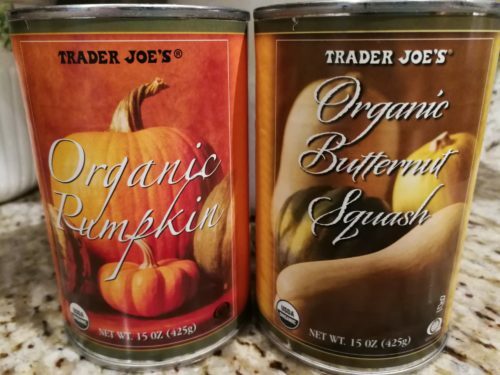 Variations: You can use roasted pumpkin or butternut squash chunks in place of the pureed canned version. Chopped toasted pecans or pistachios can be substituted for the chopped walnuts. Try some chopped fresh dill as a garnish instead of the parsley. If you have meat-eaters, you could drizzle some creme fraiche or heavy cream over their soups although I don’t really think it’s necessary.